Lunch is too often overlooked. It’s not branded as the “most important meal of the day,” and it’s generally not as leisurely as dinner. It’s just something you have to do every day, like flossing (to get rid of the spinach you ate at lunch). But lunch deserves our love and attention, and there are restaurants all over the city with the same philosophy. 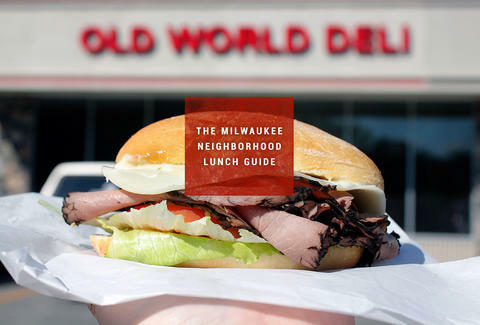 Here are the best lunch spots in 14 neighborhoods around MKE, so you’ll never have to dig a granola bar out of your glove compartment again. The little Fork Cafe inside this natural foods co-op grocery store has a soup calendar so you can plan your lunches around your favorite homemade choice. 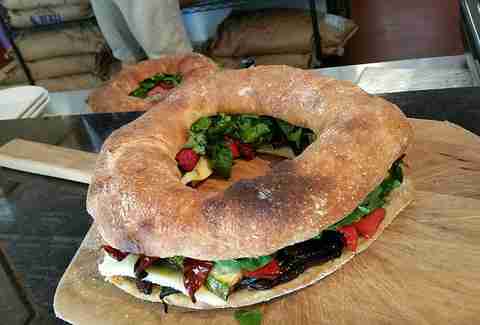 Sandwiches range from hippy-style tofu to meaty Cuban. There’s also a hot bar, salad bar, sushi, and more protein-packed quinoa salads than you can shake a carrot stick at. You can’t eat at a Jamaican restaurant and bypass the jerk. Bone-in chicken gets rubbed with a thick spice paste and charred on a grill, then it’s served up with cabbage, fried plantains, and of course, rice and red beans. Wash it down with the grapefruit soda Ting. “Chinese buffet” strikes fear into many, but this one is nothing like those buffet-only, sushi-and-soft-serve monstrosities. It’s a small place, but that means dishes are refilled and fresh all the time. Chinese-American faves like beef with deep-fried green beans, curried Singapore noodles, and chicken in garlic sauce are almost always available. The crab rangoon and chicken breast fried in a sweet batter are some of the best around. You can satisfy any Polish grocery needs here, from smoked herring to czernina (aka duck blood soup). The highlight is the deli case though, full of smoked sausages, bacon, and deli meats and cheeses. There’s a handwritten sandwich menu on the wall and you can’t go wrong with any of them. Freshly baked crusty rolls are packed with just-sliced meat and veggies along with a thick layer of mayo, mustard, or horseradish. Downtown workers flock to this lunch-only Pakistani restaurant in the basement of an ugly office building. Everyone gets the same thing, a combo plate, with two curries, basmati rice, and a drink. Chicken masala is super popular, but most curries are vegetarian, like dal, saag paneer, and chana masala. Don’t skip the spicy green chutney in the squeeze bottle. 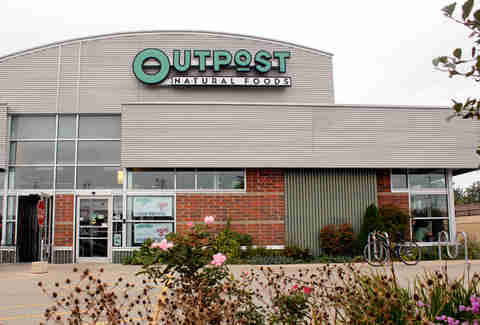 Located in the MATC building, this is the most unique restaurant on this list. It’s run by students as a final course in the culinary arts program. It’s only open for lunch during the school year, but it’s worth fitting into your schedule. You’ll get high-end, top-quality food and service -- students run every aspect of the restaurant, including front of house -- for a fraction of the price anywhere else. Check its website for hours and upcoming menus. Plus, feel good that your entire tip goes to MATC scholarship funds. 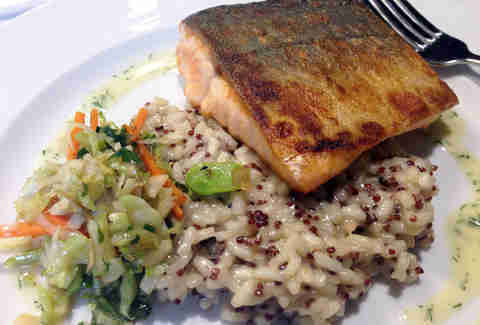 This new age cafe caters to vegans and carnivores alike. 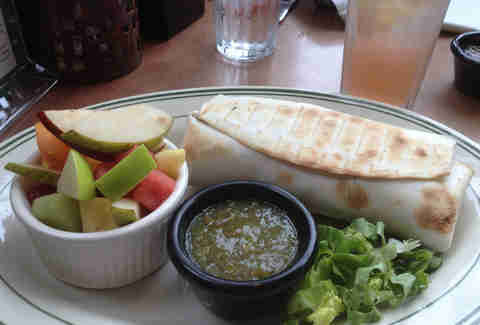 You won’t miss the meat in its burritos, though. Try one stuffed with oven-roasted sweet potatoes, black beans, corn, Mexican rice, and guacamole. If you’re not too full, there’s always the dessert case tempting you with banana cream pie and tall poppyseed tortes. Not only does Bombay Sweets have great samosas, it's got great curries as well. Choose your favorite with paratha and you’ve got an Indian feast. The most expensive thing on the menu is about $8 -- and that’s a thali platter -- making it priced perfectly for lunch. 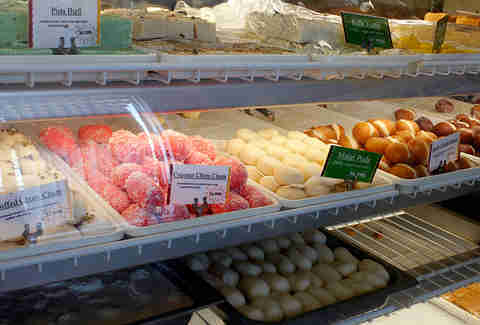 Grab a few gulab jamun and burfi on the way out. 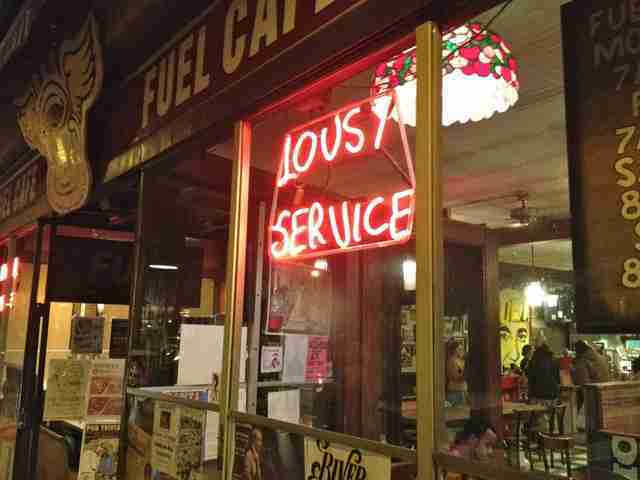 Only in Riverwest can a cafe with a “lousy service” sign be so popular. 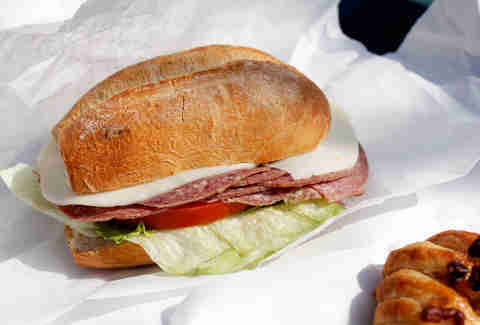 The no-nonsense attitude fits right in with the neighborhood vibe, and so do the sandwiches. The Buttafucco is an Italian grilled cheese sub with tomato, onion, herbs, and mayo, but hot giardiniera peppers are added to heat things up a little. 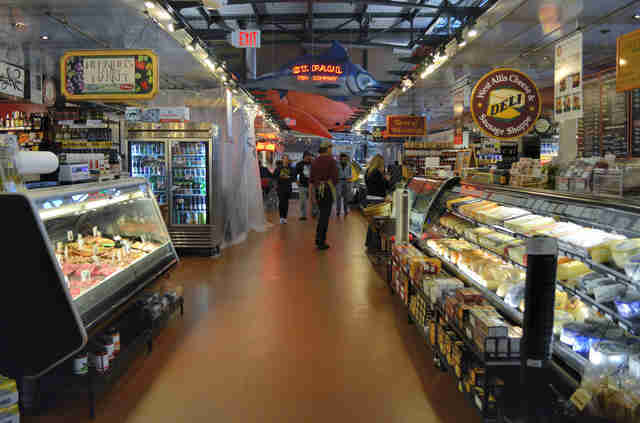 The Public Market is like a restaurant, butcher, produce market, bakery, wine bar, and gift shop all rolled into one building. Options abound for lunch, from pita sandwiches to Thai, but one thing you can’t miss is the lobster roll at St. Paul’s. It’s in a heavily buttered and toasted top-cut bun, just like it should be, and it’s full of lobster salad. 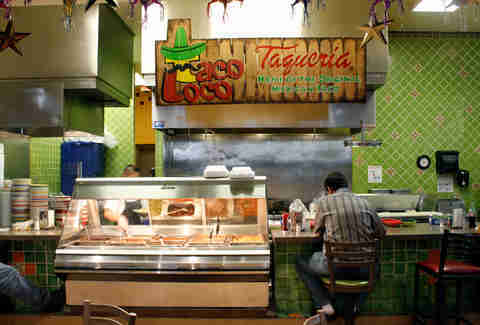 All of the locations of this Hispanic grocery store have taquerias in them. The menu is simple, so stick to the basics and order a bunch of tacos. You can get practically any filling you can imagine, from barbacoa to chicharron, plus seasonal specials. Since you’re in a grocery store, you know it’s all fresh, right down to the salsas. It doesn’t always have chicken pot pie -- in fact, its small lunch menu rotates daily -- but when it does, you better get it. Unlike some shortcut pot pies with only a top crust, this pie is fully enclosed in flaky pastry; it is a bakery after all. When you’re done, heed the siren song of the display cases and get yourself something sweet for the road. 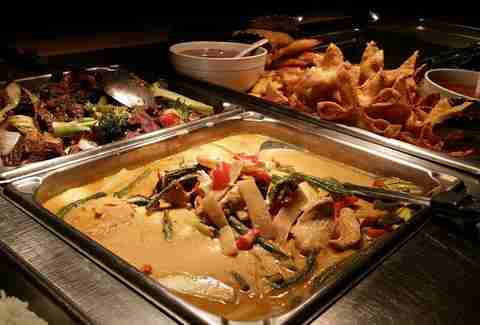 This is a popular Thai/Vietnamese/Laotian restaurant, and if you’ve never tried it before, the lunch buffet is a great way to sample lots of things without burning a hole in your wallet. There’s always a couple cold salads like larb or bun, a soup or two, various deep-fried things, and a whole steam table of various stir fries and Thai curries. Big portions, small prices is the name of the game here. Known for its dim sum, it should be equally known for its lunch specials. None are over $6.25, and all come in huge portions with fried rice and an egg roll or crab rangoon. 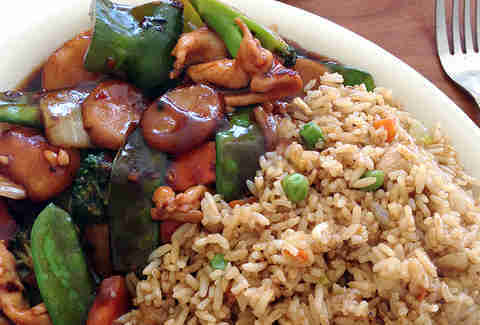 All the favorite Chinese-American favorites are listed, from General Tso’s to shrimp & broccoli. Lacey Muszynski is a Milwaukee native whose grandmother use to make czernina. It’s not as bad as it sounds! Follow her on Twitter @worthhersalt.